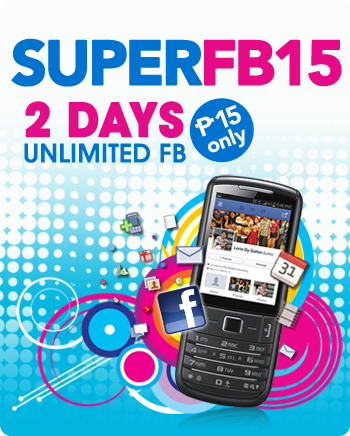 Globe SuperFB offer you to enjoy unlimited Facebook access on your mobile phone for as low as P10 per day. OR, get 2 DAYS of unli FB for only P15 for more happiness. Hurry Up! Promo valid until June 30, 2013. Enjoy 24 hours of Unlimited Facebook access for P10 only. Enjoy 2 days of Unlimited Facebook access for P15 only. Enjoy 7 days of Unlimited Facebook access for P50 only. Enjoy 30 days of Unlimited Facebook access for P199 only. You can also register via *143# and select SUPERFB under Surf Promos. For more details and updates, please visit Globe website and Facebook Page. SUPERFB is also available to TM subscribers. Just call *143# and select SUPERFB under Mobile Internet Promos. *(1) Subscribers must have at least P1.00 to register. (2) Clicking on external links like YouTube, Yahoo, etc. will be subject to regular browsing. **Not valid for use on Opera Mini browsers. Regular browsing charges will apply. kung unlimited po cxa, so pwede manood ng videos sa facebook? Pwede bang mag video call? pwede ba ito pang video call? basa basa din pag may time ! Hurry Up! Promo valid until June 30, 2013.
ilan po ang LIMIT CAP ng UNLIMITED FB nyo sa superfb promos? Hi! Can I use superfb even if I’m in vietnam? Makapag vedeocall ba ang super fb?